Vembu VMBackup backs up VMware vSphere ESXi hosts and vCenter Servers which includes full support for VMware vSphere v6.7! Vembu VMBackup supports the hot backup of VMs running on Microsoft Hyper-V servers. A dedicated filesystem for Backup data storage and Backup data replication to offsite or remote location ensures the data redundancy and industry best Recovery Point Objective (RPO) less than 15 minutes. 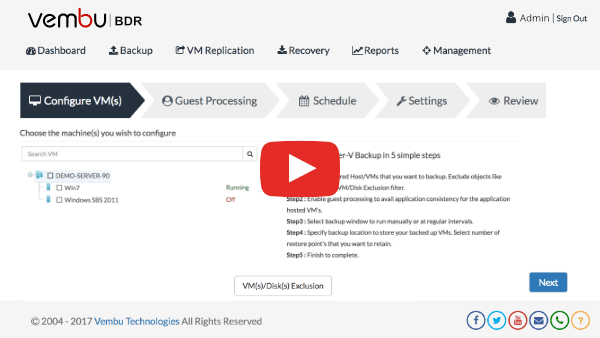 Vembu VMBackup also supports the legacy restore options such as full VM recovery to VMware and Hyper-V. The recoverability of the backed up VMware, Hyper-V VMs and physical machines are confirmed by running integrity tests. VMBackup offers three-tier backup verification check and it avoids data loss after recovery. Backed up VMs or physical machines will be instantly booted as a VM by reading the backup storage targets on Hyper-V or KVM. Vembu VMBackup offers free migration tools as part of backup and disaster recovery solution. Helps to migrate Windows servers and Workstations deployed in physical machines and other hypervisors to KVM environment.